The CETA issue has become very urgent, The treaty is due to be signed in October and it still not clear if EU MEPs will have a debate before it is signed. Therefore Global Justice Sheffield has proposed to change the focus of our joint campaign. Instead of lobbying the city council to pass a symbolic motion the new plan is to lobby MEPs about CETA. I think it makes a lot of sense. Sheffield campaigning groups will lobby Linda McAvan, who is based here. 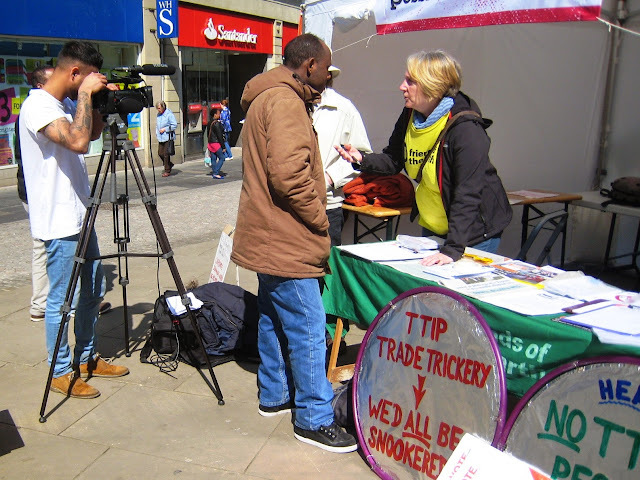 Other campaign groups in the Yorkshire and the Humber anti-TTIP network will lobby the other 5 MEPs. Oliver from Global Justice Sheffield will send a letter to Linda McAvan to ask for a meeting in September. I propose to represent Sheffield Friends of the Earth at the meeting with Linda McAvan in September. Other campaigning groups that will have representatives are Global Justice Sheffield (Oliver Blensdorf), the Sheffield branch of UNISON and perhaps someone to speak for the NHS, e.g a member of Keep Our NHS public if they are interested. We decided at our meeting that we are happy for Francois to keep lobbying on behalf of Sheffield Friends of the Earth.